“Hardball” is exactly the kind of idiotic, boring and sluggish endeavor any number of us would come to expect from director Brian Robbins, the man who single-handedly concocted the moron comedy “Ready to Rumble,” the insulting “Varsity Blues” and the pointless dreck known as “Good Burger” all in less than five years. Perhaps we should give him credit for at least trying though; this is probably a better movie than all three of those put together. And yet you can’t help but wonder, with or without answers, if his mind was simply lost in orbit when he even considered taking on this obvious and predictable project, especially since we’ve already seen it played out a good two or three dozen times in the last twenty years alone. At this point, it’s safe to say that this genre has gone into too many extra innings. The film is the halfhearted result of hundreds of sports movie and coming-of-age-flick clichés, thrown together without even the slightest care or reason. 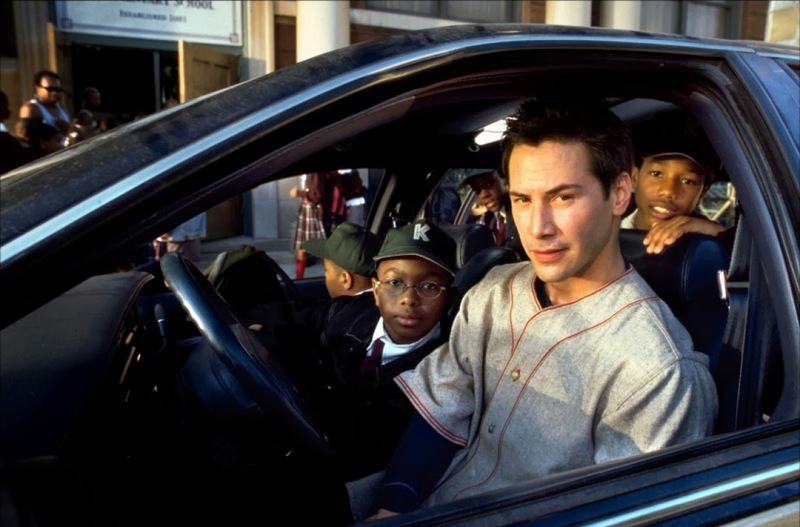 The picture stars Keanu Reeves as Conor O’Neill, a Chicago resident whose bad gambling habit has gotten him into hot water with a couple of local loan sharks, whom he has borrowed money from but is unable to pay back. A broker, however, offers to help by paying Conor to coach an ailing Little League baseball team, made up of smart-mouthed African American boys whose biggest talents are nowhere near the game field. The question is, can Conor survive this experience long enough to help bring himself out of debt? The obligatory hook of this movie (and all of its not-too-distant cousins, mind you) is that the detestable main player’s experience turns him into a better, more likable person: someone who is not just a coach to these young people, but also a friend and a mentor. Soon he’s helping the youngsters with their homework, shielding them from a crime-infested neighborhood, getting into the good graces with their parents, and even offering them advice on how to survive being so young. Then Diane Lane, who plays the teacher Elizabeth Wilkes, walks onto the screen, and suddenly Reeve’s character is back to the same kind of person he was at the start of the picture: a loathsome and spiteful creature whose bitterness towards even the simplest things is not just appalling to watch, but impossible to understand. The movie makes its setup clear (that O’Neill is flaky, rude and naive all at the same time), but the script unwittingly reinforces those aspects just when we think its high time that the character should start growing up. By the time real progress is made, we have lost interest. The kids are charming (mostly when they’re not spewing out insults at everyone around them), but they are often sidelined because the picture cares less about the teamwork and more about the gambling debt. Diane Lane, meanwhile, offers some respectable (if very limited) work on screen as a teacher who enjoys seeing her students push for success, and sometimes even sees a bright side of Conor beginning to surface (although judging from his repetitive negative attitude towards her, we don’t always understand why). What of the rest of the picture? Two words: standard stuff. The premise is uninspired, the conviction is routine, and the story simply does not follow the path that it should. We want to know more about these young baseball players: what their lives are like, why they seem so fearless on the outside, what they have to put up with in their bad neighborhood, and most importantly, what it takes for them to work together as a team. Instead, we wind up with a central focus on a man whose stupidity gets him into trouble with bookies, and then traps him into a situation that fails to make him a better person until the very final moments of the movie. Talk about a bad value judgment.